This shortcode renders detailed statistics on the traffic generated by an affiliate. 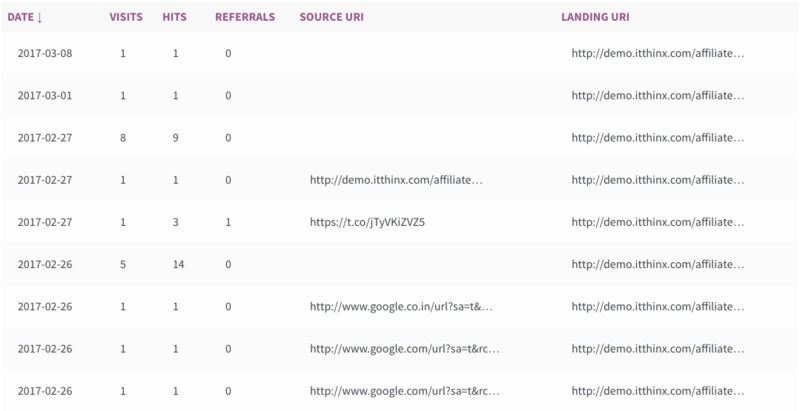 Each entry shows traffic results for each combination of Date, Source URI and Landing URI related to the affiliate. 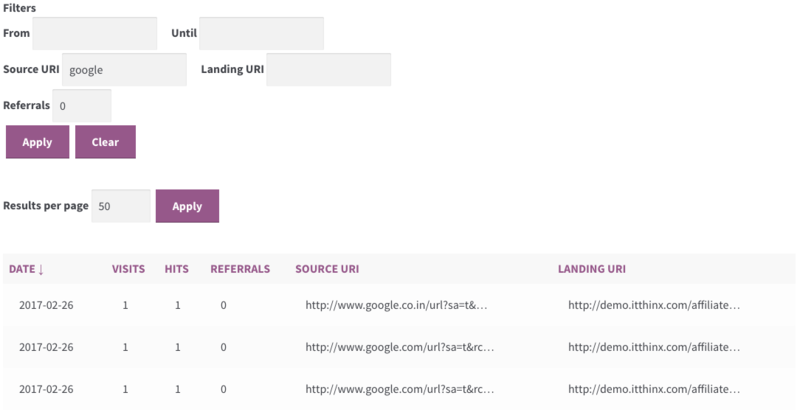 Entries show the Visits, Hits and Referrals for each combination of Date, Source URI and Landing URI. Thus an affiliate can see the visits, hits and referrals that originated from and lead to certain pages on dates where this data was recorded and available. In some cases, the Source URI or Landing URI is unknown and those entries will show empty cells in the table. An example where the affiliate has filtered the set of traffics entries that originated from URLs containing “google”. The results can be sorted in ascending or descending order if you click on the column title. You can configure the shortcode to hide specific columns by using attributes. The default value for the attributes is “yes" and can be hidden by setting it to “no". show_dates – Defaults to "yes", used to include or hide the Dates column. Indicate "no" to hide the column. show_visits – Defaults to "yes", used to include or hide the Visits column. Indicate "no" to hide the column. show_hits – Defaults to "yes", used to include or hide the Hits column. Indicate "no" to hide the column. show_referrals – Defaults to "yes", used to include or hide the Referrals column. Indicate "no" to hide the column. show_src_uris – Defaults to "yes", used to include or hide the Source URI column that shows the origin for a set of related visits, hits and referrals. Indicate "no" to hide the column. 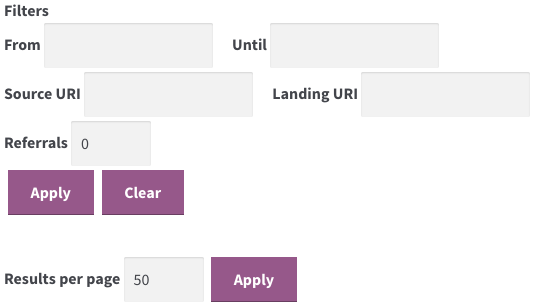 show_dest_uris – Defaults to "yes", used to include or hide the Landing URI column that shows the destination for a set of related visits, hits and referrals. Indicate "no" to hide the column. show_pagination – Show the pagination block. Default value is "yes", indicate "no" to hide this block. src_uri_maxlength – Truncate the displayed Source URI to this length or use 0 for unlimited lengths, the default lentgh is 33.
dest_uri_maxlength – Truncate the displayed Landing URI to this length or use 0 for unlimited lengths, the default lentgh is 33.